All models use collapsible steering columns. 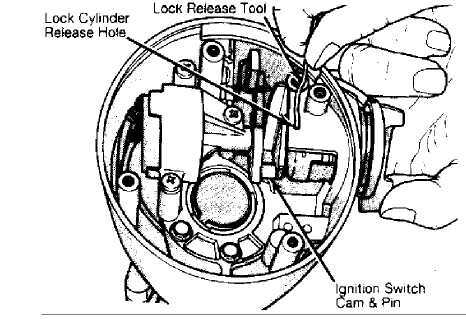 All columns have integral ignition switch and locking device. Optional tilt wheel is available with both A/T and M/T. 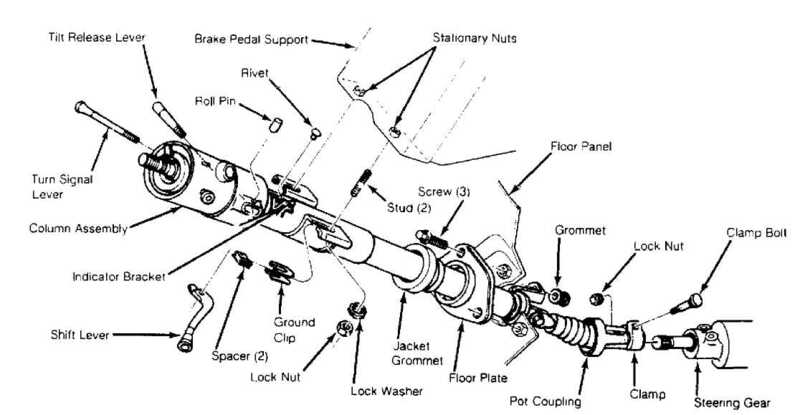 Transmission shift linkage is integral on all models except those with floor shift. 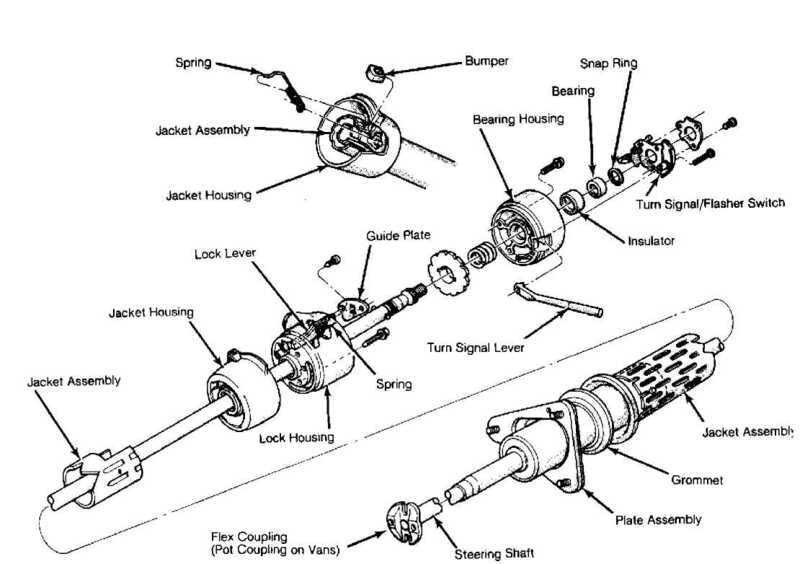 NOTE: Steering column removal and installation procedures refer to all manufacturers. Not all procedures, however, apply to all models. cable clip. Remove cable from lower bracket. "Pot" coupling or "U" joint from pinion shaft. panel steering column cover. Lower reinforcement. Disconnect bezel. Remove indicator set screw and gearshift pointer from shift housing. NOTE: On vehicles equipped with cruise control and M/T, take care not to damage clutch pedal cruise control switch. and insert shaft. Raise column assembly into position onto studs. rearward. Tighten nuts to specification. See TORQUE SPECIFICATIONS. steering wheel (if equipped). Install steering wheel retaining nut. Tighten to 45 ft. lbs. (61 N.m). On models with A/T, install gearshift indicator pointer. The steering column with a floor mounted gearshift is basically the same as previously described. Standard columns and service procedures are identical except as described below. * In place of rotating shift housing, there is a plastic shroud which is fixed to lock housing. Shroud covers jacket and lock inhibitor assembly. It is held in place by a tab that fits under side cover and one screw. Shroud can only be replaced by removing lock housing from jacket. A spring is attached between shift housing and column jacket. NOTE: All columns are similar except for appearance of covers. Some models use ignition key light, while others do not. Disassembly and reassembly procedures cover all models. 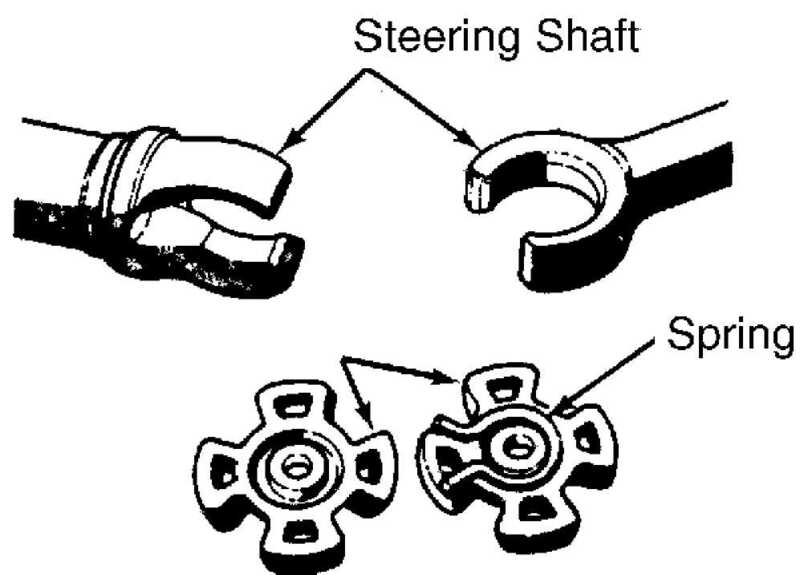 Some procedures may not apply to every steering column. out with a punch to remove shift lever. clamping at column bracket. DO NOT distort column. Remove turn signal lever cover-to-lock housing attaching screws. Remove cover. Remove wiper/washer switch assembly. Pull switch cover up wiper/washer lever. Remove lever sleeve-to-switch attaching screws. 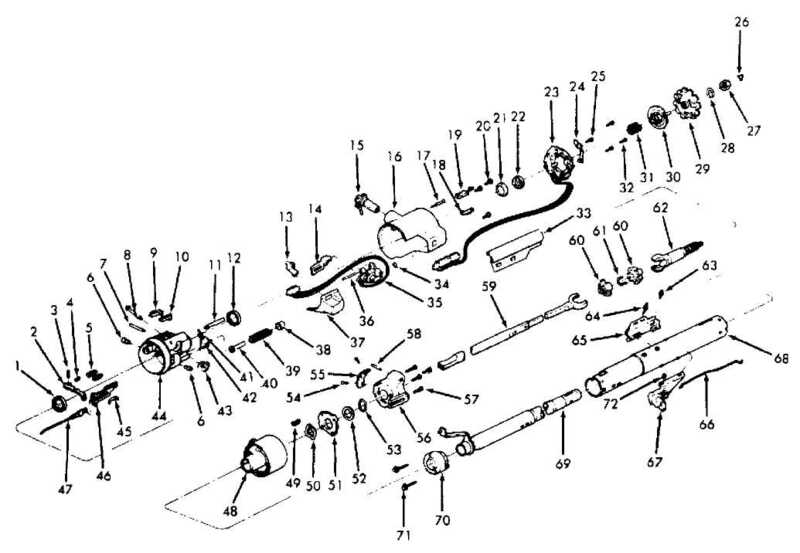 Rotate wiper/washer shaft to full clockwise position. retaining screws. Remove retainer. Lift switch upward out of way. Unclip horn ground wire. Remove ignition key light retaining screw. Lift ignition key light out of way. shaft through lower end of column. screw. Lift out key warning switch. 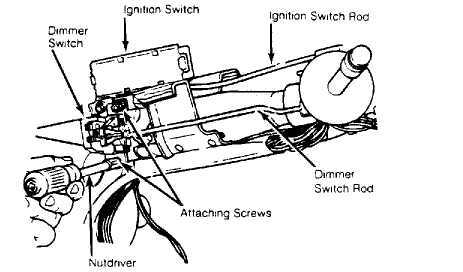 Remove 2 ignition switch-to-column jacket retaining screws. See Fig. 2. 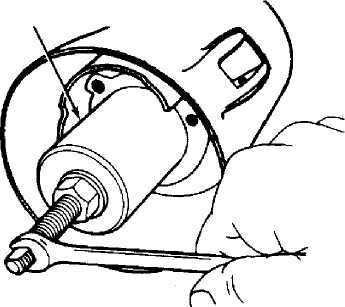 Remove ignition switch by rotating switch 90 degrees on actuator rod. Remove 2 dimmer switch retaining screws. Disengage dimmer switch from rod. 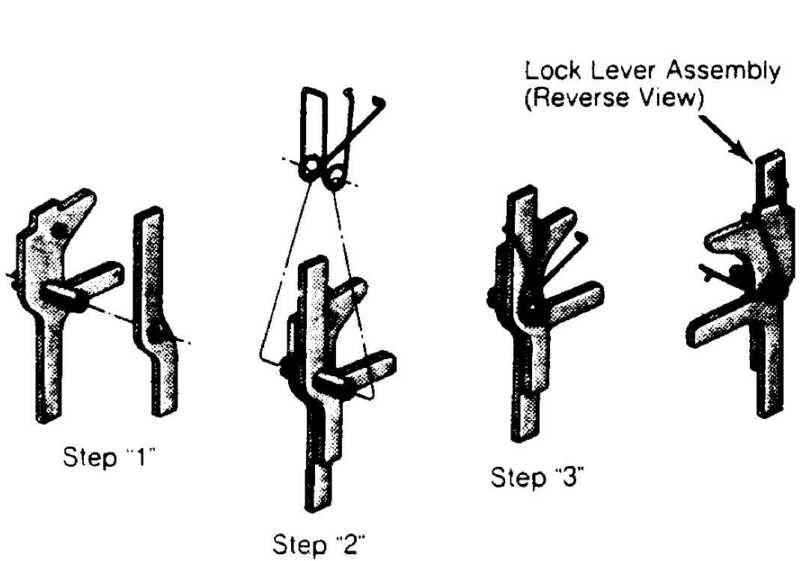 key, place cylinder in "LOCK" position. Remove key. Remove 4 lock housing-to-column jacket retaining screws. body off shaft and shoe assembly. 2) Use new 1/8" diameter by 1/4" long (1/8" grip) aluminum blind rivets (if necessary). DO NOT use steel rivets as rivets must shear upon impact. Position crossover load spring and shift lever in gearshift housing. Tap pivot pin into place. See Fig. 5.
housing-to-jacket screws. Tighten alternately to 90 INCH lbs. (10 N.
and assemble 2 lock levers, lock lever spring and pin. See Fig. 6.
casting notch. See Fig. 7.
rod down column. Install bellcrank onto its mounting surface. Gearshift lever should be in "PARK" position. loaded retainers will snap into place, locking cylinder in housing. through space between housing and jacket. Remove ignition key. bearing support (floor shift), bearing and spring on steering shaft. column assembly. Press upper bearing into upper bearing housing. Bearing must be fully seated. 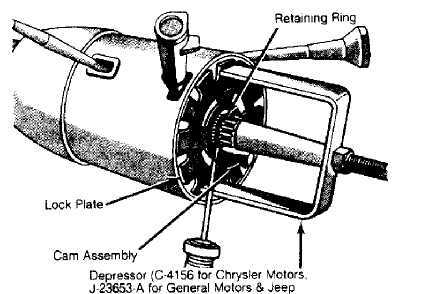 Push up on steering shaft to compress bearing and spring. housing retaining screws to 35 INCH lbs (4 N.m). housing. Install turn signal switch in bearing housing. positioned toward ground clips before tightening. signal switch. Install dimmer switch rod and dimmer switch. wires. Install new retainers (if necessary). sleeve-to-wiper/washer switch retaining screws. Remove sleeve. for Jeep), depress lock plate. Pry retaining ring from groove. Remove key light. Place lock cylinder in "LOCK" position. boss. Depress spring latch at bottom of slot. Remove lock. Remove 3 housing cover screws. Remove housing cover. actuator rod may be removed from cap (if necessary). clockwise with a second wrench to withdraw pivot pin from support. upward to extend rack fully. actuator. Rotate housing clockwise to free dimmer switch actuator rod. Remove activator assembly. Remove coupling from lower end of steering shaft. Double coupling is retained to shaft with a roll pin. Remove shaft assembly from upper end. CAUTION: DO NOT drop or bump steering shaft as plastic pins may shear. support to lock plate. Remove support from end of column jacket. Remove 2 attaching screws and shift gate from support (if necessary). Dimmer switch is removed with support. 14) Using a screwdriver, remove shift tube retaining ring. Remove thrust washer. Remove 2 screws from lower bearing. Remove lower bearing from jacket. 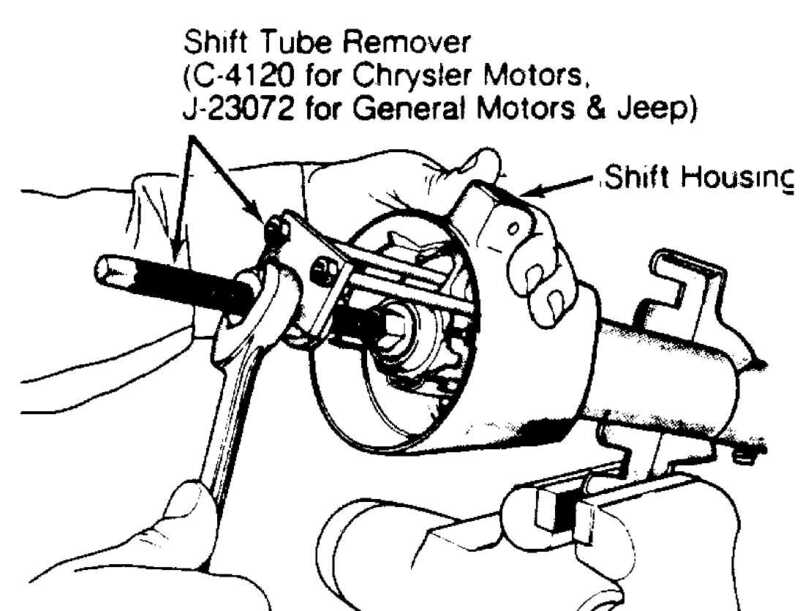 Using Puller (J-23073-01 for Jeep), remove shift tube from bowl. Insert bushing on end of puller in shift tube to force tube from bowl. DO NOT hammer shift tube as plastic joints may shear. opening. Remove wave washer. Remove bowl from jacket. Remove shift lever spring from bowl by winding spring up with pliers and pulling out. tap drive shaft from sector. Remove drive shaft, sector and bolt. Remove rack, spring and shim (if used). Remove tilt release lever pin. Relieve load on lever release by holding shoes inward. shoe pin. Remove lock shoes and lock shoe springs. from housing. DO NOT reuse bearings. multipurpose grease. Clamp column in vise so that both ends of column are accessible. Install bearings in bearing housing (if removed). facing up, the 4 slot shoe should also face up. 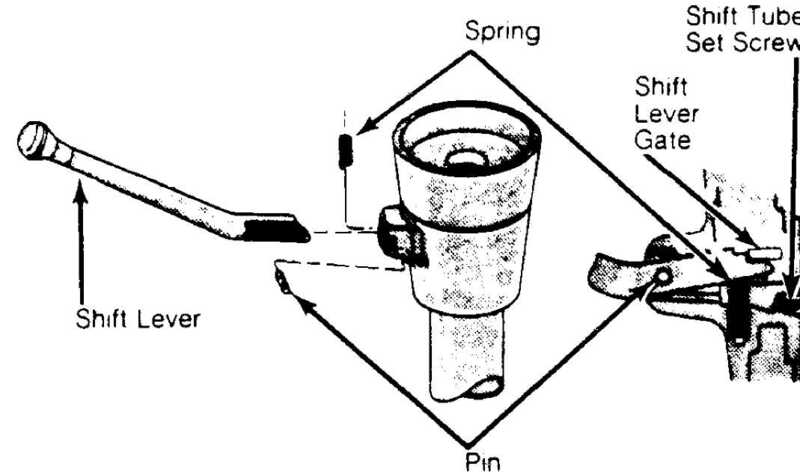 Install spring, release lever and pin in bearing housing. should engage block tooth on sector. shift lever spring in bowl by winding up with pliers and pushing in. Slide bowl into jacket. Install wave washer and jacket mounting plate. jacket opening. Slide jacket mounting plate in jacket notches. Carefully install shift tube in lower end of jacket. wave washer, install thrust washer and retaining pin. jacket mounting plate. Tighten screws to 60 INCH lbs. (7 N.m). Install lower bearing on lower end of jacket (if removed). serration of lower shaft assembly. ignition switch actuator rod between bowl and jacket from bottom. assembly for ease of movement. rod. Guide end of actuator rod into pivot slot during cover assembly. Hold cap so that cover will slide over it. retainer clockwise to engage. Install bearing inner race and seat. housing cover with contacts facing lock cylinder bore. screws to 25 INCH lbs. (3 N.m). Install hazard warning knob and screw. Jeep), depress lock plate. See Fig. 12. Install a new retaining ring. Install ignition lock. Turn key to "LOCK" position. Remove key. Insert cylinder into housing far enough to contact shaft. replace ignition switch, position key cylinder in "LOCK" position. Fit ignition switch actuator rod into slider hole. INCH lbs. (4 N.m). DO NOT move switch out of detent position. With a light upward pressure on switch, install 2 screws. on steering column. Install 2 bolts. Tighten to 105 INCH lbs. (12 N.
shaft. Support coupling under joint. Drive in roll pin. replaced. Install new bearings if bearings are removed from housing. Never reuse old bearings.